In an attempt to increase overall sales of its Acura division, Honda Canada launched the Acura 1.6 EL in 1996. Despite the Acura logo, it was still just a more luxurious and powerful version of the Honda Civic. It was successful nonetheless and EL sales allowed the Acura division to lead all other Japanese manufacturers in this category. The same recipe was then used on the EL’s replacement, the CSX, in 2006. The CSX was abandoned last year when the Civic was updated, and now a new model that borrows from the original Civic recipe has come back even stronger. The ILX uses the Civic’s platform and some of its mechanical components, but the changes are reasonably significant – as will be the distribution since it will also be sold in the United States. Also note that unlike the EL and CSX, the ILX will not be assembled in Canada, but rather in the Honda plant in Indiana. This company’s management has long coveted success in the luxury car category and its approach for the ILX is unusual. What was once a unique model is now offered in three different configurations. The base version is powered by a 2.0-litre engine that produces 150 horsepower. The only available transmission is a five-speed automatic that allows to you change gears using shifters located behind the steering wheel. Fuel consumption promises to be about 8.6 L/100 km. If you’re a sport driving enthusiast or just always in a hurry, you’ll be able to order a 2.4-litre version. This engine is a still a four-cylinder, but it produces 201 horses and is paired exclusively with a six-speed manual gearbox. Acura tells us that their engineers spent a lot of time and energy developing a gearbox that shifts with speed and precision. 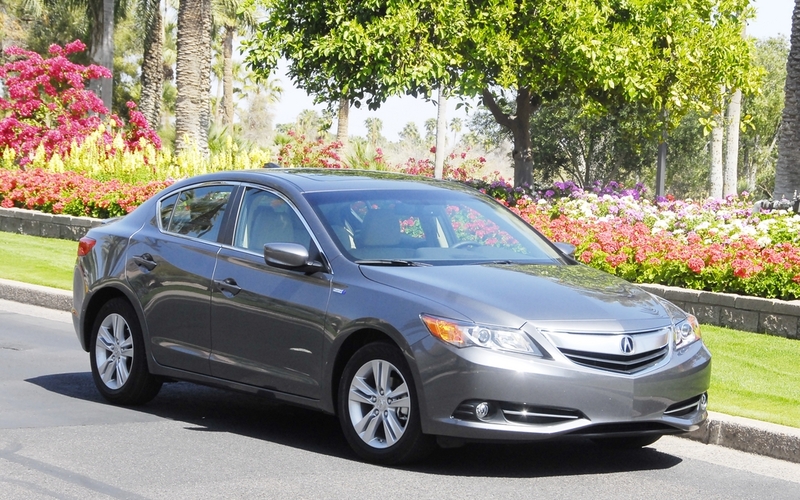 Eco-friendly drivers who want to treat themselves to a little luxury in a compact car will be able to choose an ILX hybrid. Its 1.5-litre gas engine is supported by an electric motor that generates 110 total combined horsepower. It’s only available with a CVT gearbox. This drivetrain should help obtain rather impressive fuel consumption of about 5.0 L/100 km. That’s 4.8 L/100 km less than on the 2.4-litre 201-hp engine. But note that this 1.5-litre takes super! As you’d expect, Acura engineers designed a new suspension and shock absorbers, both of which provide a good deal of comfort and excellent handling. On the versions that preceded the ILX, the Canadian development team didn’t have the technical and financial means to concoct an all-new car. They paid special attention to modifying its appearance, particularly the front grille and fog lights, in addition to adding a few luxury features in the passenger compartment. This new product, however, is designed for with all of the Americas in mind, and not surprisingly, the resources dedicated to its development and adjustments were much more significant. The exterior shape is very plain, although the decorative chrome stripe on the upper part of the front grille – the brand’s visual signature – remains. But note that it’s more discrete than on some other Acuras. Above all, the passenger compartment is the most outstanding feature. The dashboard is exclusive to this model. The materials are smooth and the presentation is elegant, while the instruments and electroluminescent gauges are user-friendly. Meanwhile, the front seats are comfortable and offer adequate thigh support but, and this comes as no surprise, the back seats are just OK. Taller people wanting to squeeze in back will have to convince the front seat passengers to cooperate. Finally, the quality of the materials and assembly is impeccable. The Honda Civic upon which this model was based is recognized for its agility and the ease with which it weaves in and out of traffic, not to mention its excellent feedback. You get all of this from the new ILX, but with varying degrees of intensity. Depending on the version you choose, the car either offers more comfort, more performance or is a little less fun to drive. The 2.0-litre trim will be the top seller. Its handling is flawless, and its steering is precise yet slower than that of the Civic. The soundproofing and overall comfort of the passenger compartment are noteworthy, but another gear on the five-speed automatic transmission would be a welcome addition. This car is more likely to be referred to as conventional rather than responsive, which is pretty much in line with this sedan’s purpose. The sport version, equipped with a 2.4-litre engine, accelerates with gusto and its manual gearbox is a delight. The brakes seemed more powerful to me. As for the hybrid version, its accelerations are a far cry from sporty, that’s for sure. To get the most out of this engine and its continuously variable transmission, you have to know how to adapt your driving style to maximize performance while using as little fuel as possible. On the highway, for example, using the cruise control makes driving more pleasant. In conclusion, the ILX’s engineers and stylists did a good job: the car has a shape that, while unspectacular, is just fine for the category and its passenger compartment is comfortable and luxurious. The handling could be a little sharper, but it’s in harmony with buyers’ expectations. The ILX is also competitively priced, with the most affordable version, the ILX2.0, selling for $27,790 while the version with the 2.4-litre Dynamic engine goes for $29,990. And if the hybrid’s your thing, you’ll have to fork out $34,990.